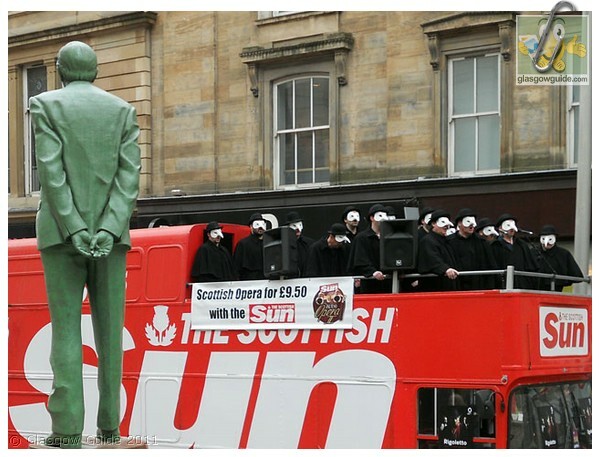 Opera singers stage a free open-air concert for shoppers in Buchanan Street under the watchful gaze of Donald Dewar. The improptu performance was to mark the Scottish Sun's 'Night At The Opera' event on May 9, which is returning to the Theatre Royal with Verdi's Rigoletto. Tickets, at £9.50, cost less than a tenor. Click here to download a free MP3. Some of the small wooden crosses posted in honour of our fallen heroes who fought in wars across the world. 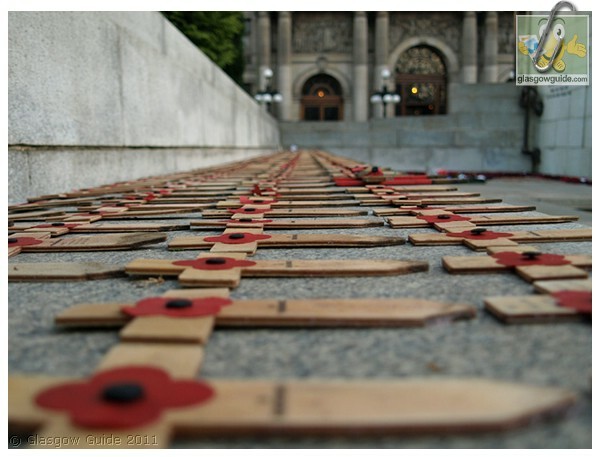 The crosses were originally placed in the remembrance garden in George Square on Remembrance Day 2010. The crosses were looked after by Glasgow City Council parks' department workers, who carefully lined them up along the north side of the Cenotaph after the garden was removed. 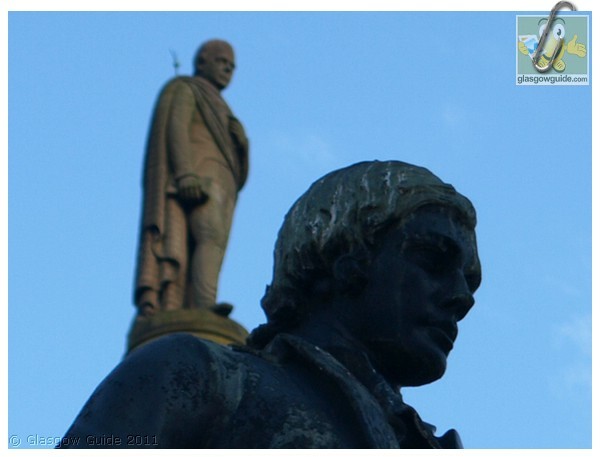 Walter Scott towers above Rabbie Burns in George Square, though not in the literal sense. The life and works of Burns will be celebrated tomorrow, Burns Night, at supper events all across the world. The statue of Scotland's most famous poet was unveiled in 1877 in front of a huge crowd of 30,000 people. It was made by the sculptor G E Ewing and was cast by Cox & Sons Founders, London. The money for the statue was raised by public subscription, with 40,000 ordinary people donating a shilling each to commemorate "The Bard". The statue shows Burns standing by a tree stump with his bonnet in his right hand and a pen in his left. One of my favourite photographs taken during the recent very cold weather over December 2010 and early January 2011. 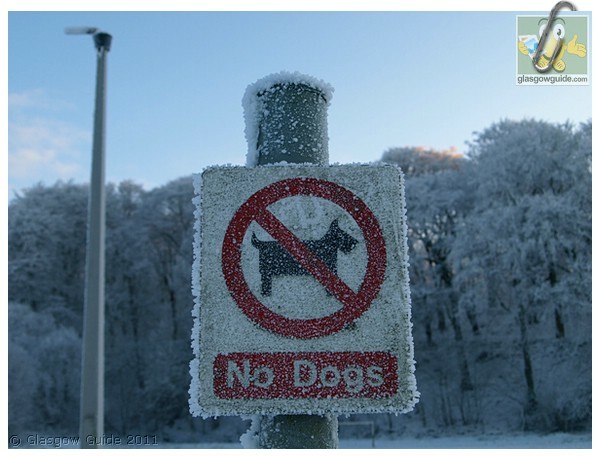 In this case, it was a photo of a 'no dogs allowed' sign in Ardencraig Road in Castlemilk, next to Cathkin Braes. It was about -10 degrees Centigrade and everything that was not covered in snow was frozen solid! Needless to say, there were very few dogs around that day. 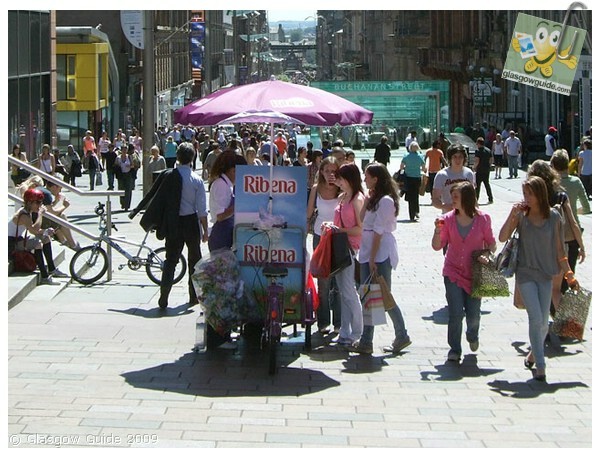 Shoppers take the opportunity of a free sample of the new Ribena range to cool down on a walk up a sunny Buchanan Street. This week Glasgow was once again confirmed as the best shopping location in the UK, outside London, after it was again placed in the top 20 of European Retail Centre according to commercial property specialists Experian. Buchanan Street remains the city's premier retail destination. City office workers take the chance to catch up on some sun-bathing in the early June sunshine. This newly-developed stretch of riverside walkway on the north bank of the Clyde at Broomielaw is part of a wider £30m plan to regenerate the city's waterfront. The workers are facing the new Tradeston Bridge, or Squiggly Bridge, as it has become known (unseen). 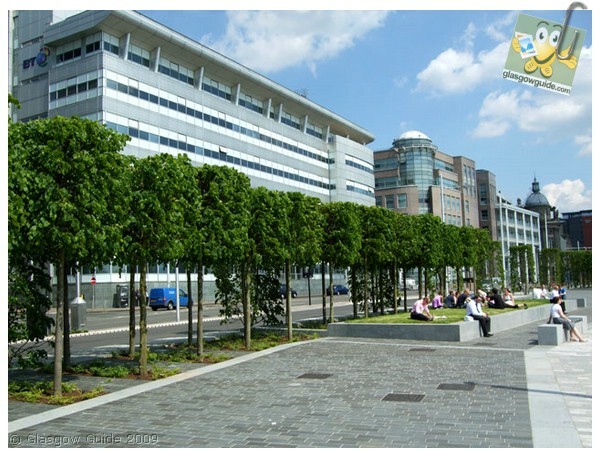 The Pacific Quay building on the Clyde is the new headquarters for BBC Scotland, situated opposite the SECC and next to the Science Centre. The new building is a dynamic broadcasting centre and a benchmark in terms of state-of-the-art technology and production methods, across TV, radio and online. All BBC Scotland's national broadcast output comes from the building, including the hugely popular Reporting Scotland, Frontline Scotland and Sportscene. 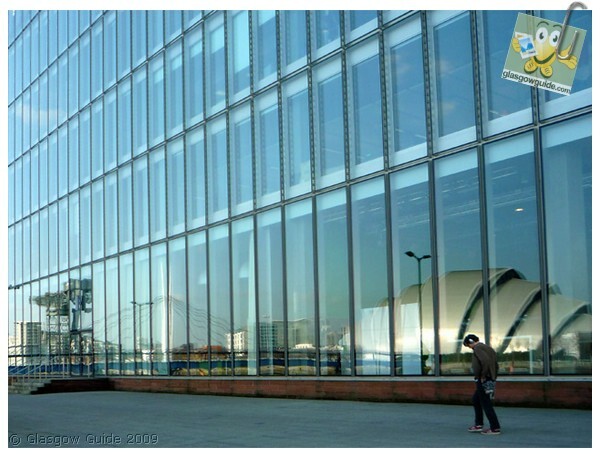 Pacific Quay reception is open to the public - from interactive displays to viewing pods there is plenty to see and do. 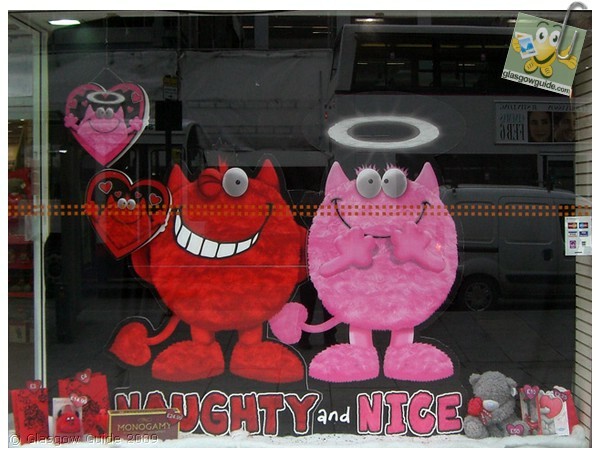 Amid all the gloom and doom surrounding the city's high streets, here's a shop window made up in anticipation of St Valentine's Day 2009 to cheer us us all up: 'Naughty and Nice' from Clinton Cards in Argyle Street... which one are you? Glasgow's second most famous architect (after Alexander 'Greek' Thomson), Charles Rennie Mackintosh was born in Parson Street, Townhead, in 1868. Some 140 years later a monument was erected to the great man in the district he was born in, although one of his early works, the Martyrs' Public School was designed by him as a gift to the community he grew up in, and is still there today. 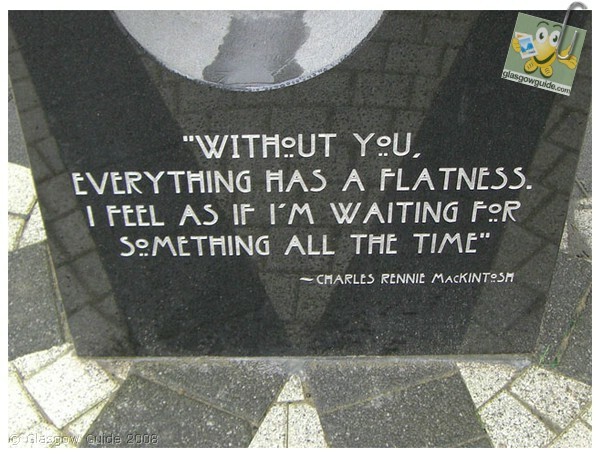 Without you, everything has a flatness. I feel as if I'm waiting for something all the time. 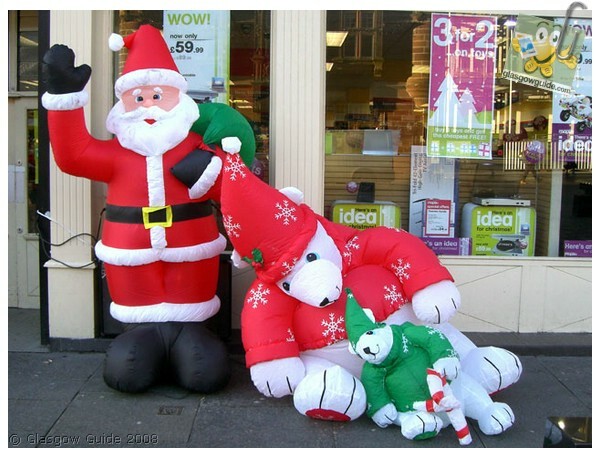 Looks like Santa's helpers have been indulging in something a bit stronger than milk and cookies, if this photo of blow-up decorations outside Maplins in St Enoch Square is anything to go by... hopefully they'll have recovered their composure in time for the Big Day!